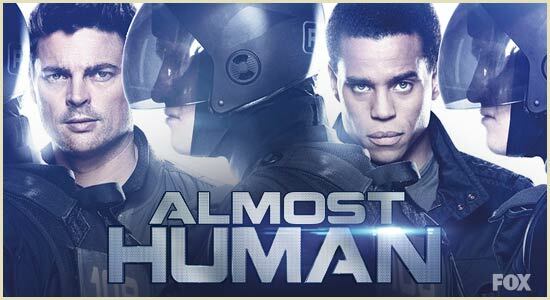 FOX'S "ALMOST HUMAN" LOOKS ALMOST PROMISING! Almost Human looks interesting! However, I will stymie my excitement and allow myself to eagerly anticipate this new sci-fi series. It's been a while since my cable box has been tuned to FOX. Not since "Heroes" and the cancellation of "The Event" have I allowed myself to get sucked suckered into any of ABC, NBC, CW or FOX's programming . Much like the SYFY Channel these networks have a habit of canceling promising sci-fi shows prematurely. For NBC this is unforgivable . Because, NBC has a knack for fast-paced dark storytelling, which makes for excellent sci-fi television series and their concepts are usually very interesting . Almost Human is produced by J.J. Abrams, which makes me a little wary. Though he is on fire with films, Abrams' history with television series hasn't been all that great. Nonetheless, I for one am excited about the new sci-fi lineup scheduled for the small screen this season. SYFY's Contiuum, Defiance and Helix, and FOX's Almost Human means science fiction isn't dead on television yet. Almost Human stars Keith Urban, Michael Ealy, Minka Kelly, Mackenzi Crook, Michael Irby and Lill Taylor. I hope we can get at least three GOOD seasons, before FOX even considers pulling the plug!